Our worlds, both the seen and the unseen, are all created with the same layers and structures. These building blocks of energy make up everything that we can touch, see, and feel, and are often known as “sacred geometry.” In our last blog, we talked about how these sacred patterns and designs can be witnessed in nature, in music, in architecture, and everywhere else. Specific mathematical proportions have laid a strong foundation for reality as we know it, but they can also be potent for our personal healing. These basic shapes typically fold into and add onto each other, to create more complex designs. Just like a skyscraper is build from hundreds or thousands of cube shapes, our own bodies are built from the ground up with sacred geometrical shapes. Our souls are knit with the fabric of these beautiful designs, and they are so much fun to work with, especially in energy healing! Like in our last blog, I’ll be using sacred geometry cards from Francene Hart. Last time, we talked about the tetrahedron- one of the five basic building blocks of all matter, sometimes called the “platonic solids.” This time, we will learn about one of the most beautiful and versatile arrangements in sacred geometry: the seed of life. This shape, is created from the combination of seven perfect circles. They are most often seen in a round pattern, with six “petals” surrounding the seventh circle in the middle, but they can also be seen as a line or cascade of hoops. Some say that these seven circles represent the seven chakras, the seven colors of the rainbow, or the musical scale. The seven seeds or loops are thought to hold the potent energy of creation and consciousness, and the seed of life is often thought of as a symbol of wholeness, diversity, fertility, strength, and balance. However, there are many different ways to work with this design, and I’ve pulled two different cards for us to explore! First up is card #51 from Hart’s Sacred Geometry Cards for the Visionary Path. As you can see, the seven circles are arranged in a long, cascading line, representing a waterfall of sorts. Each of the seven circles is a pool of cleansing water, symbolically flowing through all seven of the chakras. This card is a powerful reminder to never forget about our innate ability to heal ourselves, and that we have the ability to cleanse our energy fields whenever we wish. You can read more about the importance of this kind of “energy hygiene” here. 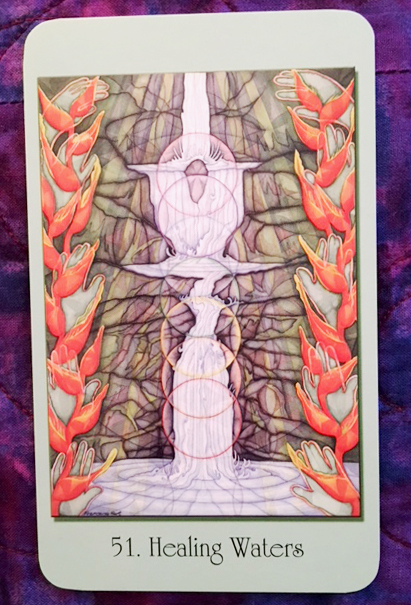 The healing waters card asks us to tap into the cleansing flow, whether we are watching the ocean waves, canoeing on a lake, or even if we are simply standing in the shower. You can imagine yourself being washed clean, and starting anew on your healing journey. In doing so, you are also contributing to the healing of the collective consciousness; each time you choose healing and love over injury and fear, you lift up everything around you. #34 from Hart’s Sacred Geometry Oracle deck. As you can see the intricate pattern of the seed of life surrounds the entire design, overlain with butterflies and dragonflies. 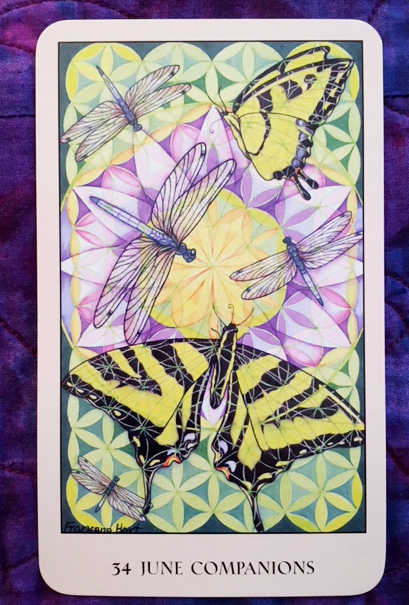 This is a powerful card of transformation, and speaks to the inner shift that you are experiencing. Just like both the butterfly and dragonfly must progress through different stages before their flourishing, we must also be patient and honor our own transformative process. The changes in our life will unfold in a series of events or stages too, like our winged friends. This card, June Companions, asks us to be open to receiving wisdom and guidance from both rational and intuitive sources. We are on a path of change, and we have the opportunity to co-create the reality that we want. Through quantum physics, we understand that all matter contains tiny pockets of light, and between these pockets lie “choice points.” We are always in control of our destiny, and we have the power to choose which turns to take on our personal path. We can meet the changes with joy or with hesitation, and the butterfly and dragonfly invite us to choose the former. The seed of life, and its larger manifestation, the flower of life, are very important designs in sacred geometry. These patterns have been seen in ancient texts and architecture, and go back thousands of years! Working with these symbols may unlock a new spirit of wholeness and alignment within you, so I invite you to play with them with open curiosity. Explore the seed of life in your own meditation or mindfulness practice, or the next time you receive energy work. Of course, if you want to pull your own cards from my sacred geometry decks, get in touch with me to book your session!